Patio heaters are the perfect choice for outdoors in courtyards, conservatories and gardens. For more information please contact our Project Division on 0345 345 2288. Warmup patio heaters emit radiant heating to warm an area up to 10m². We all want the pleasure of being able to sit outside, whether to enjoy the peace and tranquillity of the garden, to dine or entertain friends and family – our patio heaters allow you to do that earlier in the spring and later into the autumn. Warmup patio heaters, are the perfect choice for outdoors in cafes, bars, rooftops, courtyards. Homeowners benefit from having the patio heaters in conservatories and gardens. 5 times cheaper to run than an equivalent gas heater. This product comes with a 5 Year Warranty. We are confident in the standard of our products. The Warmup Snow Melting Cables protect against snow and ice build-up over both concrete and asphalt surfaces to improve accessibility and avoid accidents. 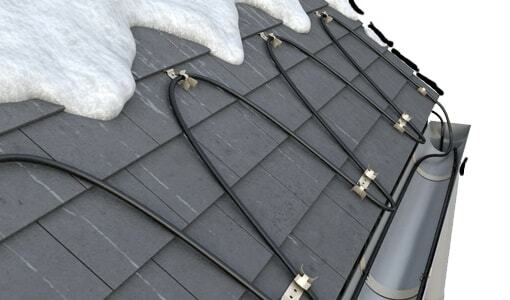 The Warmup Self-Regulating Cable protects against dangerous build-up of snow and ice on roofs, within gutters and downpipes and prevents pipes from freezing.